Give more than presents this holiday season, share the gift of caring with those who matter to you most! With the holidays around the corner, the USC School of Social Work believes that there is no better time to encourage random acts of kindness. The simple act of telling someone why they matter could have a bigger impact than you know. For that reason, you’re invited to participate in You Matter, a grassroots campaign designed to foster well-being and bring back some much-needed human connection. We are on a mission to spread as much positivity as possible, and we hope that you’ll join us! 1) Download a Care Card from the MSW@USC blog. 2) Write a message with someone in mind. 3) Snap a picture of your card and share on social media using the hashtag #youmatter and tag us @youmatterbc to inspire others. 4) Give the Care Card to someone and make that person’s day! There’s never a better time than now to show others that that they matter in this world. If you love this campaign as much as we do, we ask that you please pay it forward by featuring #YouMatter on your blog. Sounds like an interesting campaign, even if she did neglect to tell me I matter! 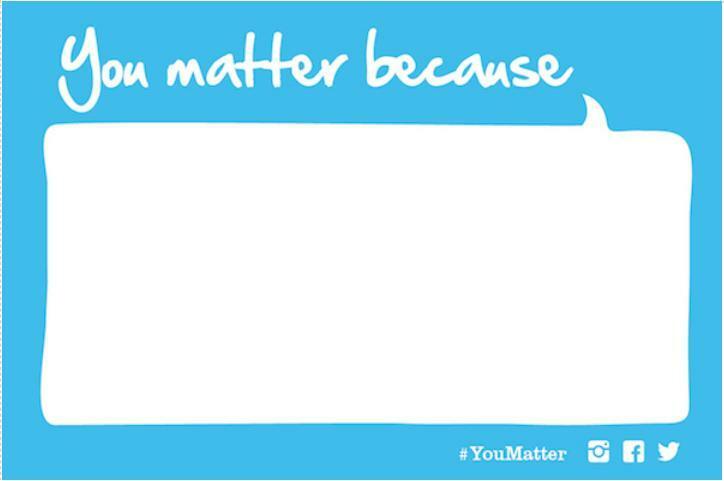 If you’re interested in participating in this project, here is a “you matter” template to use. (Just right click and “save image as…) I was going to fill in the template, but in the end decided there was no “because.” You matter. It’s as simple as that. Thanks Pat. And you know what? You matter too. Pat Bertram, you matter because when I read your blog posts I can forget about my problems and just get lost in your words. Thank you. Please keep writing!